13 I. Nairn and N. Pevsner – The Buildings of England – Surrey – 1971 – 2nd. with John Innes’s desire for a park with roads shaded by forest trees. end, regardless of direction of running. 16 Opened as ‘Old Malden and Worcester Park’ and renamed February 1862. – January 1961, for an article by Geoffrey Wilson with plans. 19 Train Operating Council (T.O.C.) Minute 3947 1 October 1923.
the eight coaches of multiple unit stock. 23 C.F. Klapper – Sir Herbert Walker’s S.R. – 1973 – p. 190. 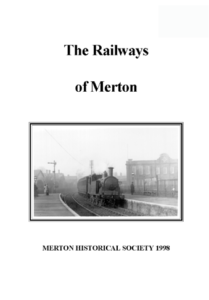 24 Wimbledon and Merton Annual – 1905 – p. 114. 26 This was a re-used bridge from near Margate. of working without a steam engine. 28 C.G. Dobson – A Century and a Quarter – 1951 – p. 121.
suspended for only two hours. 2 Charles E. Lee -Early Railways in Surrey – 1944 – p. 10.
determined by W.G. Tharby – Railway Magazine No. 113 – (1967) p. 465. 4 W.G. Tharby – Surrey County Magazine – July 1975 p. 101. – Vol I p. 25.
to Ravensbury Park, a house he had built off Bishopsford Road, Morden. at Mitcham (1891-1922) and Merton Priory (1921). Bandon Hill’. Waddon Marsh was not opened until 6 July 1930.
report (9 December 1799) concluded that the scheme was impracticable. power from waterwheels. John Rennie agreed with Jessop’s conclusion. to construct railways as feeder routes. construct and charge rent on goods lodged therein. and George Leather was engaged as resident engineer. was one and a half miles in length and was opened by June 1804.
on 1 April 1994 and the Train Operating Companies pay to use the facilities. by the Croydon Tramlink system before the next century. Mitcham and Waddon will follow the same alignment as the original. subsequent commercial development flanked the central feature. extension was the first railway to have an unattended electricity substation. A manned unit at South Wimbledon controlled Balham. continuous tunnel to 17 miles 528 yards (27.84 km.). aluminium) were introduced in April 1978.
between points of support to give strength to the weakest part. of access were turn(table) plates. assuming that they would only operate for short journeys within cities. agreement with the SR, the extended line was to terminate at Morden. (Martin Way) was also filled in this way, later becoming Mostyn Gardens. the presence of water near the surface caused a change of plan. with electric traction and thus became the first electric tube railway. opening on 3 June 1900.
were paid only about 1% in dividends, the last being paid in 1825.
for railways and horse power ceased to be of consequence. order to provide a route for the London and Brighton Railway (L&B). by the L&S and the L&B was left to complete purchase on its own. officially closed on 31 August 1846. Goat, keep its memory alive. Lord Spencer’s Wimbledon Park and ‘afterwards through the low lands’. hampered by the severe winter of 1836/7. the passenger service on the Wimbledon, Tooting and Streatham line. end in October 1927 under the supervision of the Chief Engineer, Mr.
previous authorities and to increase the authorised capital to £550,000. applied for powers to fulfil a comprehensive scheme costing £5 million. dismissed and Thomas Brassey with his army of workmen engaged. London terminus was built and named Waterloo. was found necessary to standardise timekeeping throughout the country. Hitherto each community went by the church or municipal clock. no inside door handle provided until about 1900.
hats with leather crowns, chocolate coloured coats and dark trousers. on the LSW main line and when aligned edge-on to the driver (i.e. risk opening up new areas which had a sparse population at that time. to the West End as well as the City. was not envisaged at this time. District Railway was to find the balance of the money to build the line. 1858 a guard named Baker was killed when he fell from his roof seat. Trade responded to public criticisms and adopted the recommendation. accommodated in the building of Beddington Lane station. company in 1864 to purchase property in London and create offices. for Lower Merton giving direct access to London via Merton Abbey. the junction at Tooting was removed. There were no signals. by the Board of Trade because there were insufficient signals at junctions. Bidder operated the line himself as general manager until July 1856. Mitcham and Beddington (Lane).12 Morden (Road) was added in 1857.
oldest buildings in use by a railway. Croydon and this through working continued until 1928. 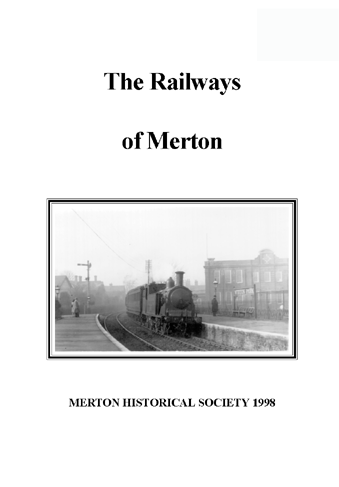 Tooting, Merton and Wimbledon Railway (TM&W) via Merton Abbey. was installed for the Croydon line. with the Peckham Rye to Sutton line, opened on that day. Mitcham station reverted to single track. the LBSC began negotiations to purchase the LSW holding for £28,000. to as ‘push and pull’ sets until the end of steam working. stock had to be found (see Electrification). past each hour at every station. rail system with 3,000V dc. Motspur Park station was opened). ticket was surrendered for cancellation and secured in a box. was introduced by the LBSC. favour of an extension of the L&C to Epsom (7 Vic. 29 July 1844). the scheme and underwrote £30,000 of the authorised capital of £70,000. Mitcham Signal Box 8/7/76 – Photograph by John Scrace Material for reconstructing platforms visible in distance on platform 10.
successors to each company continued to operate on the same basis. Kensington. The LSW operated 21 weekday trains each way. Putney to segregate District trains from their own services into Waterloo. return had been resolved20 and the duplication of tracks found unnecessary. than departmental trains for repairing the track, etc. obtained powers to increase their capital to ease their cash problems. August 1860 they promptly sought an injunction to delay the issue. preferential stock to W&D shareholders. 1 January 1869 that the other loop line via Hayden’s Lane was opened. a change in alignment between Kingswood Road and Wimbledon Station. allowing a shorter curve for the double track closer to Wimbledon station. and follows the public footpath to Dundonald Road. in joint management until the amalgamation of railways in 1923.
west of Gap Road bridge. well as many Wimbledon residents were displeased for various reasons. Streatham (TM&W), and to Croydon (W&C). recompense for their Parliamentary deposit and other stipulations. the WM&WM through Wimbledon to a terminus west of the station. was provided in west Wimbledon, although within the parish of Merton. Durnsford Road). At Raynes Park other major changes had to be made. later ran ‘push and pull’ trains 15 between Streatham and Wimbledon. to passenger traffic on 2 March 1929. The junction at Tooting was severed on 10 March 1934.
track on the less important W&C route. the Streatham to Wimbledon services. This entry was posted in Publications, Booklets, Publications and tagged in 19-century Merton, 19-century Morden, 20-century Merton, 20-century Morden, merton, mitcham, modern mitcham, morden, SIR, urban mitcham, victorian mitcham, wimbledon.